New ranks, QoL improvements to the refining process. I have to say I really like all of the QoL improvements. Requiring a ward before allowing the process to go forward is something that should have been done a long time ago. Try until succeed is something else that should have been done some time ago. A lot of excess wear and tear on mice, keyboards, controllers, and people could have been avoided. Can't wait to start testing the streak breaker addition. Hopefully it is something as simple as a 10% chance no longer taking more than 10 attempts. New item levels for old enchantments. This was somewhat foretold in the Stats and Mechanics blog posted earlier. But now we have a bit more information. 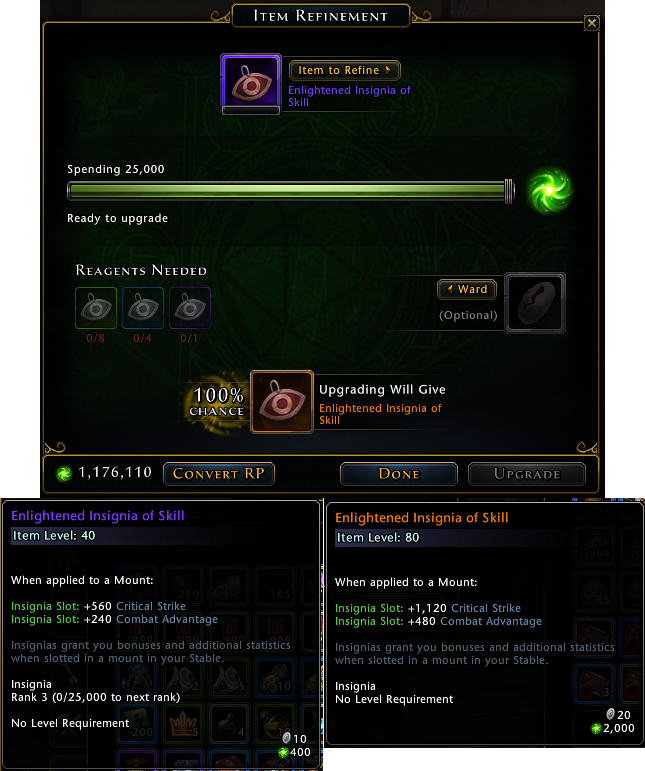 Single, double and triple stat enchantments will now have different item levels to better represent the increase in stats that a double or triple stat enchantment provides. This is a nice addition and something that has been missing for awhile now. The only way this could get any better is having the ability to upgrade our mounts as well. 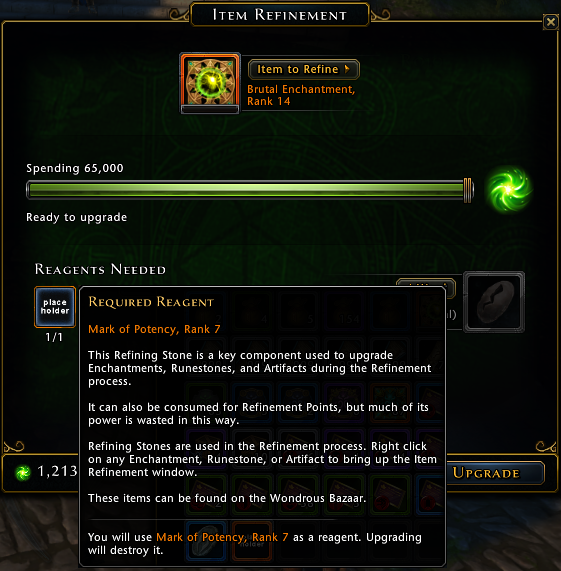 Yes, it's another way to spend our refinement points, wards, and all those extra insignia we have sitting around wasting valuable inventory space. Woah! Some huge changes here. All companions only have Bonding Runestones now, no more stats on Bonding Runestones, and Companion's Gift works instantly, no more waiting for it to proc. Everyone asked for it, and they gave it to us along with Runestones (currently only Eldritch) and Insignia (Leeching and Vigor only as they are no longer useful). As far as Runestones are concerned they state that more are coming to preview in about a week. Big concern was binding of enchants received, but I did an exchange of an unbound and I received a choice box that is bound-to-account, however, once I chose my new enchantment it was unbound. A little more about Legendary insignias. So yes, now it's possible to take your Epic Insignias to Legendary. It will cost you 25,000 refinement points, 8 Uncommon Insignia, 4 Rare Insignia, and 1 more Epic Insignia (all of the same type). The best part is the 100% chance of success. As you can see, upgrading from epic to legendary doubles both the item level and ratings given. A little about the Quality of Life improvements. 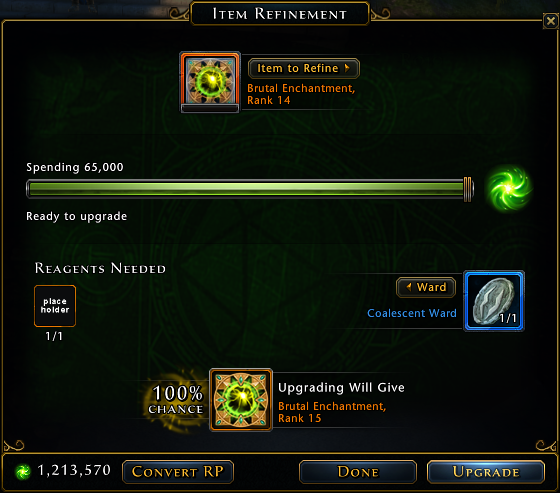 Require Ward to Upgrade is a new feature added to lessen the loss of valuable reagents. 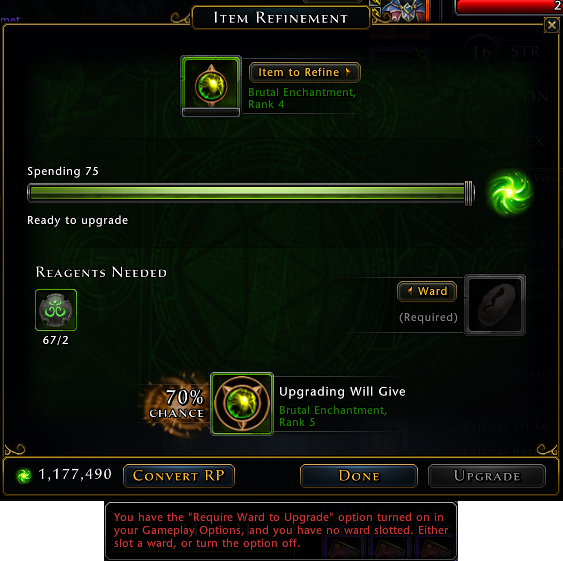 It is set to "On" by default, and will not allow you to attempt an upgrade until a ward is added or the option is turned off. Try Until Success is another new feature added to lessen the number of clicks/button pushing. As you can see, if you use this feature, it cannot be cancelled once it is started, and will only stop if you succeed or run out of wards or reagents (if you are not using wards). The two images above were both done using the "Try Until Success" option. The first one, a 70% chance, used two attempts to succeed and consumed four marks (I was not using wards). The second one, a 10% chance, required 11 attempts to succeed and consumed 10 Preservation Wards and one mark. What does all this mean? Well, this brings me to the possibility of the final QoL improvement. Streak Breaker is another new feature that is meant to insure success after a predetermined amount of failures. So, in the first example, did it succeed because the second attempt was less than 70%, or because it had reached the "Streak Breaker" limit. One failure seems a little low, anything from 50% (possibly even as low as 30%) should require at least two failures before automatically succeeding. The second example may be a better candidate for automatic success, as it was a 10% chance. Perhaps failing 10 times was enough to trigger the "Streak Breaker" effect. We'll never know for sure, unless somebody puts in some extensive testing. It was mentioned in the preview forums by one of the devs that the Streak Breaker feature goes into effect after more than one and a half times the average. That is to to say on a 1% chance you would be guaranteed success after 150 failures, a 2% chance should succees after 75 failures. Yes Rank 15 is a thing. Unfortunately, you will not be able to upgrade your Anniversary Rank 14 enchantment, or the Heart of Fire enchantment, at least not as it stands at this time. On Preview, both of those enchantments are locked in at Rank 14. No word yet on if that will change. I didn't have another Rank 14 enchantment to test, so I needed to buy a Rank 13 enchantment from the Auction House and upgrade it to Rank 14 for this little experiment. 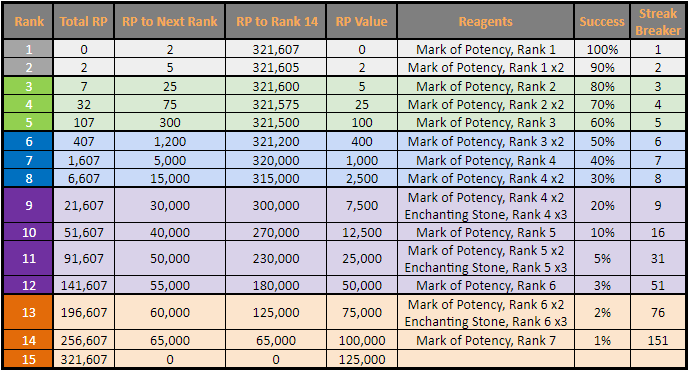 I had a decent amount of Mark of Potency and Enchanting Stone, Rank 6 (formerly Ultimate Mark of Potency and Ultimate Enchanting Stone, respectively) because i had to buy them too. I figured, what the heck, it's only Preview, not really costing me anything. So I let the upgrade go without any Preservation Wards and hit the "Try Until Success" button. Only 6 attempts on a 2% chance! I wish my luck was that good on Live. Okay, now I have my Rank 14, time to get this bad boy to Rank 15 and see what's what. 65,000 refinement points and a NEW Mark of Potency, Rank 7 (so far I have only found it at the Wondrous Bazaar for 125,000AD), and a Coalescent Ward. Yes, not taking any chances with this 1%. 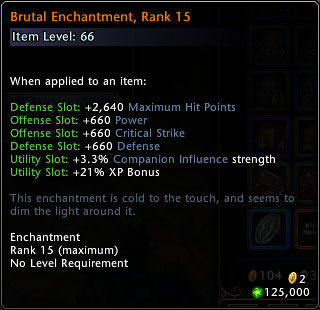 And I am now the proud owner of a Brutal Enchantment, Rank 15. With Item Level:Ratings being standardized 1:20, we can see that Hit Points:Rating has remained the same at 4:1. 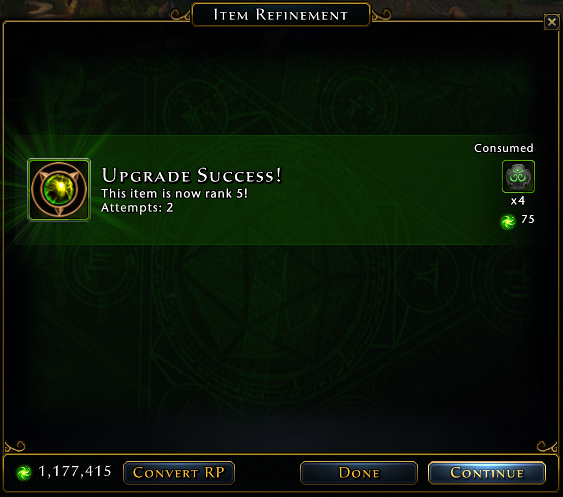 The image below details the requirements for upgrading standard enchantments and runestones. *Note: The Streak Breaker column is the number of attempts at which you are guaranteed success.